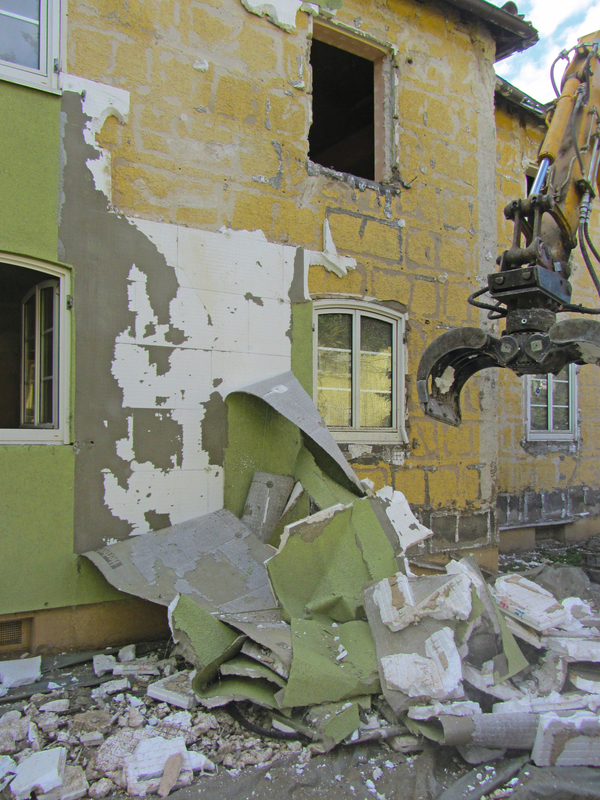 Increasingly stringent requirements made on building insulation systems and the associated rehabilitation and/or demolition projects (Fig. 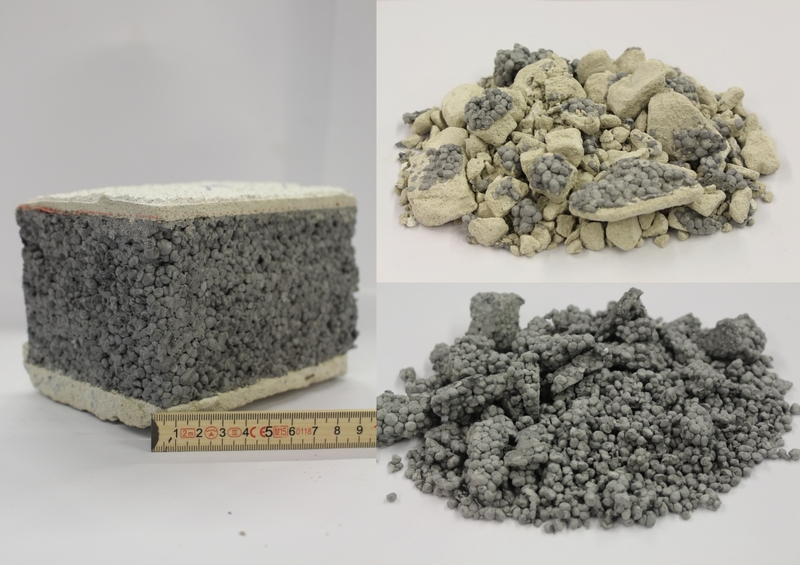 1) will in the coming few decades result in significant increases in the quantities of waste yielded from external thermal insulation composite systems (ETICS), which have been in use since the 1960s. Since, simultaneously, ever greater attention is focussing on resources efficiency, and since the existing disposal routes for these material flows are suitable only to a limited extent, if at all, it will be necessary to develop and establish new recycling routes for these flows. As a result of increasingly stringent energy-efficiency requirements made on the thermal insulation of buildings, facades have, since the 1960s, been insulated using external thermal insulation composite systems (ETICS). Expanded polystyrene (EPS) has generally been used as the insulating material, thanks to its easy processing and low costs. The long service-life of ETICS, of up to 60 years, means that the flow requiring recycling remains relatively small at present. The disposal route currently customary for this waste, via refuse incineration, nonetheless presents a challenge. Materials-route recycling methods have not yet been established . Restrictions concerning the treatment of the waste yielded also result from the hexabromocyclododecane (HBCDD) flame retardant used in EPS materials up to 2015. The structure of an ETICS is shown schematically in Fig. 2. It consists of a number of components, which are applied to the building shell in layers composed of differing materials. The greatest amount by volume is made up here by the insulating material. The insulating tiles are fixed across large areas to the substrate by means of industrial adhesives and/or mechanically, using fixing dowels, depending on the surface quality of this substrate. A primer coat with an internal reinforcing mesh, consisting generally of a glazed glass-fibre fabric, is applied onto the insulating tile. A large range of different minerally and organically bound plasters, and also flat-facing and brick-facing systems, glass and even hewn stone, are used as the top finishing layer (Fig. 3). EPS insulating tiles currently dominate the market for the insulating materials used, at around 66 % . 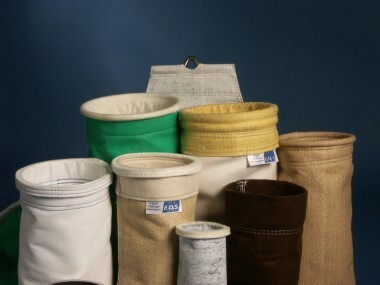 Where greater fire-safety requirements apply (in public buildings, for example), mineral wool-products are frequently also used. Other insulating materials include, for instance, rigid polyurethane foam and also insulating tiles consisting of regenerative input materials, such as softwood fibres. 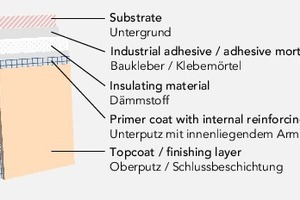 According to information supplied by the German external thermal insulation composite systems association and published in a Fraunhofer IBP study, a total of 900 million m² of ETICS was installed in Germany between 1960 and 2012 . Of this amount, ETICS featuring EPS as an insulating material accounted for some 720 million m², equating to more than 9 million t of this material. Around 63 000 t of EPS insulating materials were produced for ETICS during 2016 . At present, only few systems are being de-installed, when referred to the overall quantity of installed ETICS. The still comparatively small quantities of waste resulting from these operations nonetheless present challenges for disposal. The quantities of ETICS waste resulting from system removal are currently not registered separately in waste statistics, but are instead recorded only together with other waste accruing from the construction and insulating-material sectors (Fig. 4). It is therefore possible only to estimate the current yield of waste originating from ETICS. Selected quantity calculations and forecasts from two studies are shown in Table 1. 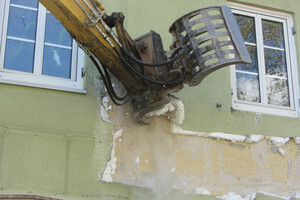 The data from both studies relates not to the quantities of EPS-containing ETICS-waste occurring and requiring management, but instead only to the EPS-content of these ETICS and/or to all EPS-waste originating from the demolition and the modernisation of buildings, and thus also, inter alia, to roof, perimeter and footfall sound insulation. The Fraunhofer Institute assumes around 9400 t/a of EPS insulating material from ETICS waste alone. When all EPS waste from the building sector is studied, some 34 500 t of EPS waste occurred in 2016, according to Conversio. Both studies anticipate a steep rise in these amounts up to the year 2050, but also draw attention to the variability of the computed scenarios. 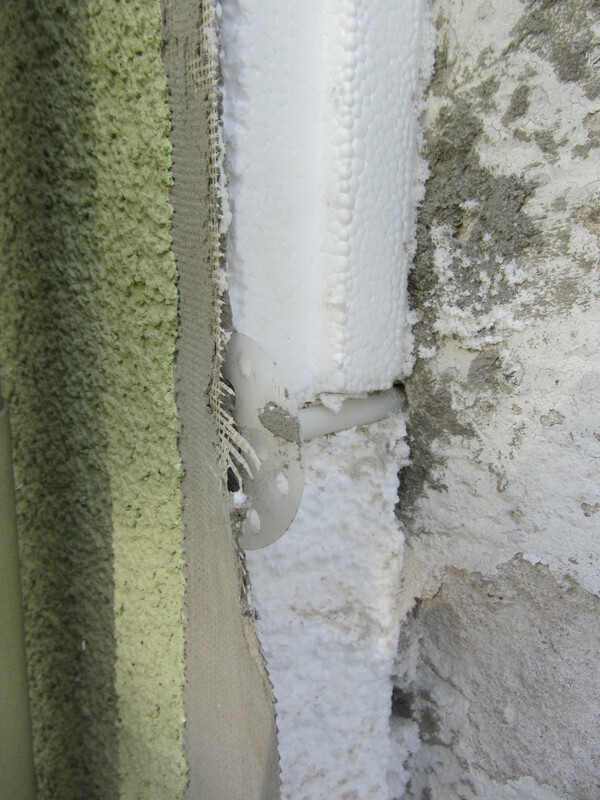 The EPS insulating layer occupies the greatest percentage volume in an ETICS. 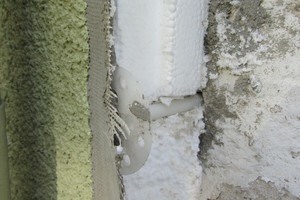 Due to the low density of the polystyrene insulating tiles (generally 15 to 20 kg/m³), however, the percentage of the plasters and adhesives by mass may be five- to more than twelve-fold that of the EPS, with the consequence that these material flows must also be taken into account in the elaboration of relevant waste-management concepts. A total waste quantity of around 500 000 t/a originating from ETICS can thus be assumed for the year 2050. The around 50 000 t/a quantity of EPS waste contained in this will have a volume of more than 3 million m³. 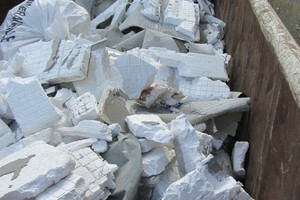 The HBCDD flame retardant added since the 1960s and prohibited in new EPS tiles since August 2015 is a problematical component of EPS insulating materials. HBCDD has been classified as a persistent organic pollutant (POP) since May 2013. Products with a content of more than 100 mg/kg HBCDD may now no longer be produced in or imported into or traded within the EU. Since late 2014, EPS insulating materials manufactured in Germany have therefore contained the new polymer FR flame retardant . 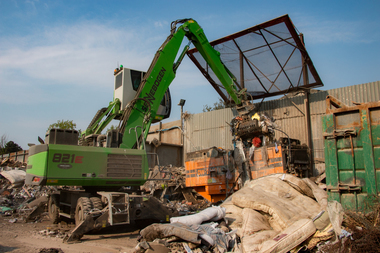 EPS waste from current demolition and modernisation projects generally contains HBCDD and care must therefore be taken to ensure that correct methods are used for disposal (Fig. 5). In Germany the disposal of HBCDD-containing waste is governed, inter alia, by a regulation on POP-containing waste , which imposes a requirement for separate collection/prohibition of mixing, documentation obligations and registration requirements. These provisions are orientated around the Certified Disposal Ordinance , although the waste in question is not classified as hazardous. These regulations do not apply to mixtures of waste with an HBCDD content of lower than 1000 mg/kg, and these can be handled and transported without special documentation. 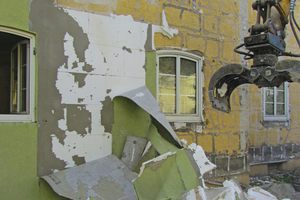 ETICS waste occurring in mixtures and with insulating-material thicknesses of, for example, 6 cm, generally fall below this limit, as a result of the high plaster content by mass, with the consequence that the above-mentioned regulations do not apply in these instances. 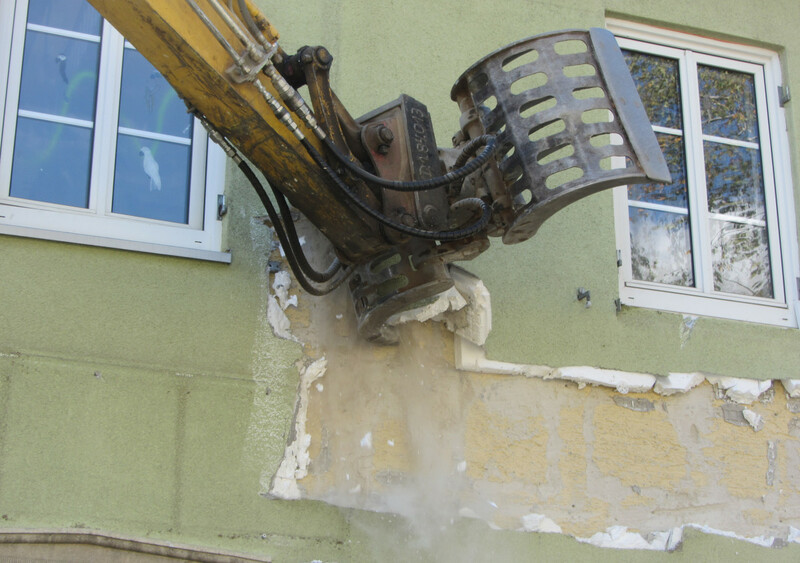 This is not the case in the context of the selective removal or complete demolition of systems featuring greater insulation thicknesses, with the result that it is then necessary to adhere to the special requirements. 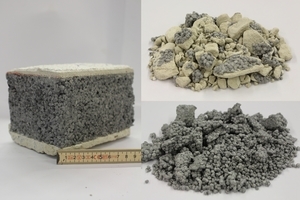 Disposal of waste currently yielded in the removal of external thermal insulation composite systems is generally accomplished in waste-incineration plants (WIPs). At 38 MJ/kg the calorific value of polystyrene is well above that for which these plants are generally designed (usually 8 to 12 MJ/kg). According to a study performed at the Würzburg WIP, the EPS content in the feed material to a WIP should not exceed 2 % by mass, in order to assure trouble-free processing . Where ETICS waste is incinerated as a complete system, the predominating plaster and adhesives contents by mass in the ETICS lower the calorific value of the mixture as a whole. Such waste then produces, at the same time, an undesirably high ash yield in such waste-incineration plants. Against the background of rising flows of waste, the legal and technical disposal requirements, and the general aims of attainment of the circular economy, it will therefore be necessary to develop and establish alternative disposal strategies. Materials-route utilisation of pure-fraction, HBCDD-free EPS waste is already practised today. This applies, however, only to cutting/trimming waste and to uncontaminated packaging waste. Waste resulting from the removal of ETICS cannot at present be fed to materials-route recycling. The recycling of HBCDD-containing waste must assure that the HBCDD is removed from the circuit: under the Basle Convention, thermal utilisation in waste-incineration plants, alongside incineration as hazardous waste, is one of a number of processes permitted for the destruction of HBCDD. Use in cement-industry rotary kilns and removal of the HBCDD content from the EPS by means of solvolysis are also legally permitted . In the case of the latter route, a pilot plant in which 3000 t/a of EPS waste will be processed by means of solvolysis, with recovery of polystyrene and bromide, is to be commissioned under the „PolyStyreneLoop“ name in the Netherlands by the end of 2018 . A research project aimed at investigating, inter alia, the materials-/energy-route utilisation of ETICS waste in cement plants is also currently being prepared at the Münster University of Applied Sciences. 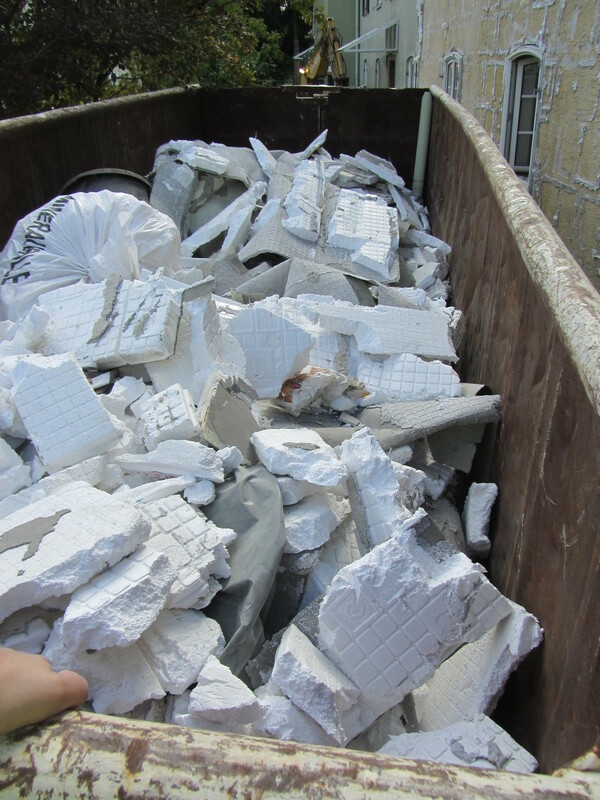 Here, the focus will not be solely on EPS as a high-calorific-value fuel, but also on the recycling of the predominantly mineral plaster and adhesive components. ETICS waste can be incinerated in a WIP without extra pre-treatment, whereas the materials- and energy-route utilisation processes make specific requirements on waste properties, with the consequence that preconditioning is a requirement. No dedicated preparation facilities for ETICS waste exist at present. Concepts for existing plants – for the preparation of construction-site waste, for example – can also not be directly applied, since the composition of this particular flow of waste differs from those of other forms of construction-industry waste. The application of differing stress loads is intended to exploit the differing comminution properties of the components being processed, in order to comminute them selectively . Unlike purely minerals preparation, which focuses primarily on brittle rock minerals, an ETICS consists of a range of different materials, each with differing comminution behaviour, making selective comminution a viable option. 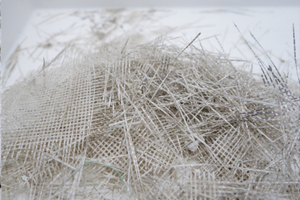 The feed material contains elastic to viscoelastic components in the form of the insulating material (EPS) and the reinforcing mesh (composed, for example, of glass-fibre-reinforced plastics), in addition to mineral components, such as adhesives and plaster, for instance. These components are bonded to each other by means of adhesives, and can optionally also be additionally geometrically locked together by means of fixing dowels, making the attainment of selectivity in comminution more difficult . Special test objects were prepared for the performance of repeatable series of tests at the RWTH Aachen University, since original de-installed ETICS exhibit a high level of material complexity as a consequence of differing product types, varying processing methods and a range of different removal methods. Among other factors, the overall fractions by mass, values yield and the purity of the product material were determined, in order to assess the success of comminution . The structure of such a test object is shown by way of example in Fig. 6 (at left). The photo at top right shows the fraction not susceptible to digestion by means of comminution. The EPS adhering here is lost for further processing. The lower image on the right shows the pure EPS fraction. The process aim is to maximise this fraction by optimising comminution. A further fraction, not shown here, contains larger lumps of EPS, depending on the loads applied, and also the reinforcing mesh. Further operations are necessary in order to separate the comminuted waste into a range of fractions effectively. The success of such further preparation is critically dependent on the upstream comminution process. Tests have been performed for this purpose at the Münster University of Applied Sciences. Screening of material fines permits the obtainment of a largely EPS-free fraction consisting of comminuted plaster and adhesive. This fraction can account for up to 50 % of the feed material by mass, depending on the scope of selective comminution and the composition of the original starting materials. It is possible, thanks to the great differences in density between EPS and the other ETICS components, to further concentrate the EPS fraction by means of density-based sorting, such as air classifying. Tests have shown that a pure EPS fraction can be generated, depending on machine setting. The magnitude of the yield of this fraction referred to the total EPS content of the waste depends on the degree of liberation achieved in comminution. The purity of the EPS fraction will inevitably fall if an attempt is made to increase yield despite insufficient digestion. The respective specifications for the targeted utilisation process are the critical factors here. If necessary, it is also possible to further separate the remaining „heavies“ fraction by means of air classifying, permitting separation of the mineral constituents and the reinforcing mesh (Fig. 7). The future rise in the amounts of ETICS waste will necessitate alternative disposal concepts aimed at achieving a „circular economy“. New utilisation processes are currently being developed, and make particular demands on the waste fed, with the consequence that preconditioning of the relevant material flows becomes necessary. These requirements must be described in quantitative terms, in order to permit systematic orientation of the necessary preparation processes around their attainment. Initial tests at the Münster University of Applied Sciences and RWTH Aachen University have demonstrated that largely pure fractions can be recovered from an ETICS waste using mechanical preparation methods. Comminution is of crucial significance in this context. 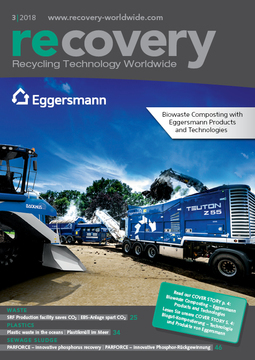 The focus in many recycling processes has, up to now, been on the EPS content. It will also be necessary to find resources-efficient disposal routes for the other constituents contained in ETICS, i.e., the plasters and the adhesives. These fractions exhibit an organics content of between 5 % and 20 % (primarily in the form of polymers). This, up to now, has complicated their recycling in the mineral sector.